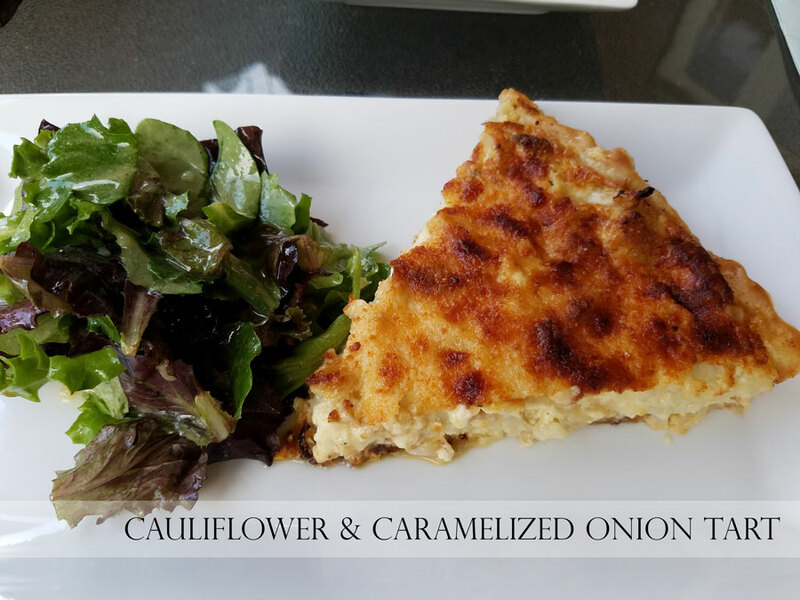 Place cauliflower florets on a large baking sheet. Drizzle with 1 ½ T olive oil and sprinkle with salt and pepper. Bake at 425 degrees for 20-25 minutes, or until golden brown, stirring ½ way through. Cool then slice cauliflower florets and toss with truffle oil. Set aside. Heat the remaining 1 ½ T olive oil in a large skillet over medium heat. Add the onion and season with salt and pepper. Cook until the onion is a deep golden brown, stirring frequently, about 25-30 minutes. Cool slightly. Unfold the sheet of puff pastry. Using a rolling pin, roll the pastry to fit the bottom and sides of an 11” tart pan. Gently place the puff pastry in the tart pan, trimming excess if necessary. Using a pastry brush, spread the Dijon mustard on the bottom and up the sides of the puff pastry. Place the caramelized onions in an even layer atop the mustard. Then, spread the cauliflower out atop the onions. In a large bowl, whisk the eggs with the mascarpone cheese, heavy cream and nutmeg until they are all incorporated. Stir in the gruyere cheese. Pour this mixture over the cauliflower and sprinkle with parmesan cheese. Set the tart on a rimmed baking sheet and bake at 350 degrees for 25-30 minutes. Cool slightly. Cut into wedges and serve with mixed greens tossed with a lemon vinaigrette.